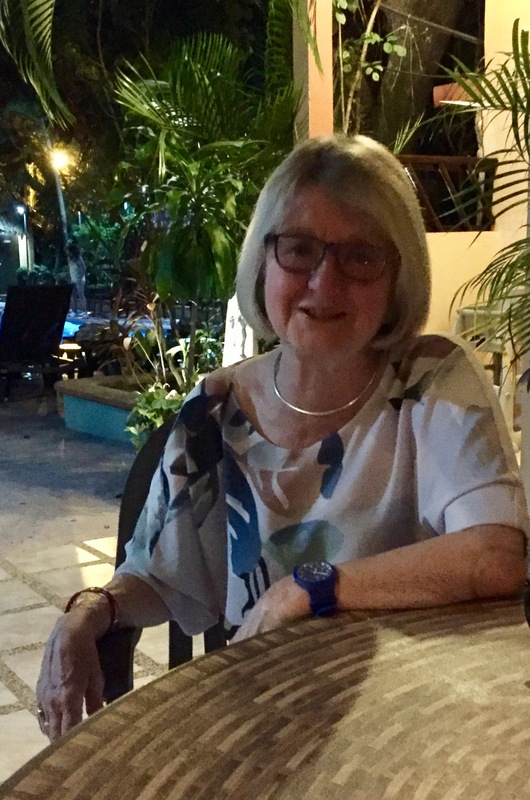 When we had eventually wended our way to the the outskirts of St Cristobel de Las Casas and reached the coach we found we had the prized front seat. It was a day of driving – an ideal day to have the best view!! 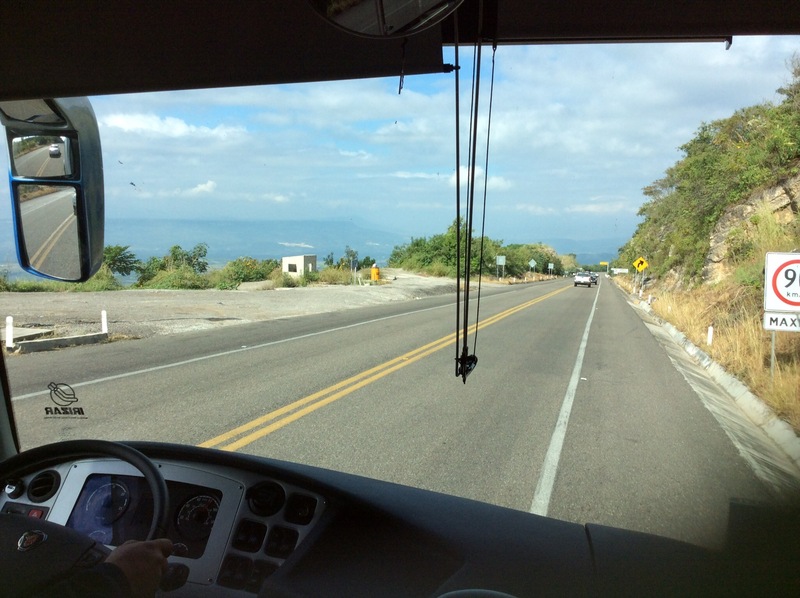 We were descending from the highlands of St Cristobel to the the comparative lowlands of Palenque. 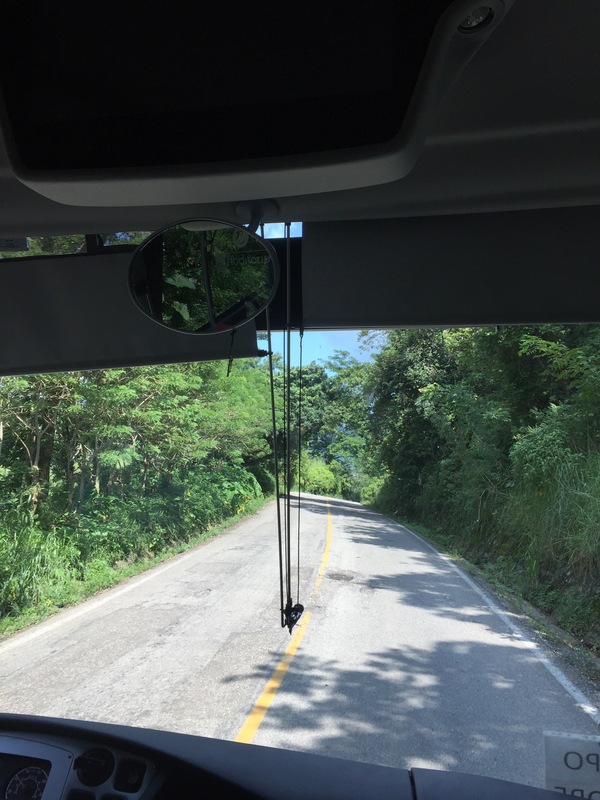 Our route had to be changed due to a huge landslide on the road we were supposed to take and so we set off on our diverted route to travel via Tabasco. ‘Oh good’ I thought ‘I will be able to buy some sauce for home….’. ‘Oh no.’ said Ana, ‘Tabasco sauce is made in California!’. Feeling a trifle foolish I slunk back to my seat……. The start of our journey was descending into a deep valley with a magnificent wide view as we rounded the corners as the road zig zagged down. Having reached the valley bottom we travelled on tolled motorways for some time. Just watching the traffic is interesting. 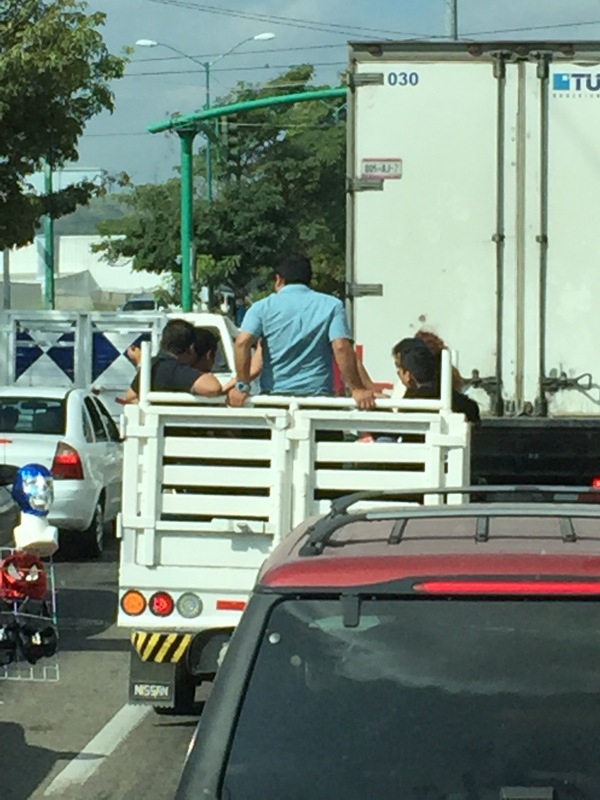 Whole families sta no in the back of trucks like penned cattle……..
We then turned off onto a road very reminiscent of an English country lane initially. Except for the vegetation! At one point two little pink pigs dashed across the road in front of us. They had obviously escaped from somewhere and were enjoying their dash for freedom! Occasionally a dog could be seen trotting along the side of the road and as it got less green and more dusty, groups of children passed us and an old man walked down hill with a stick. 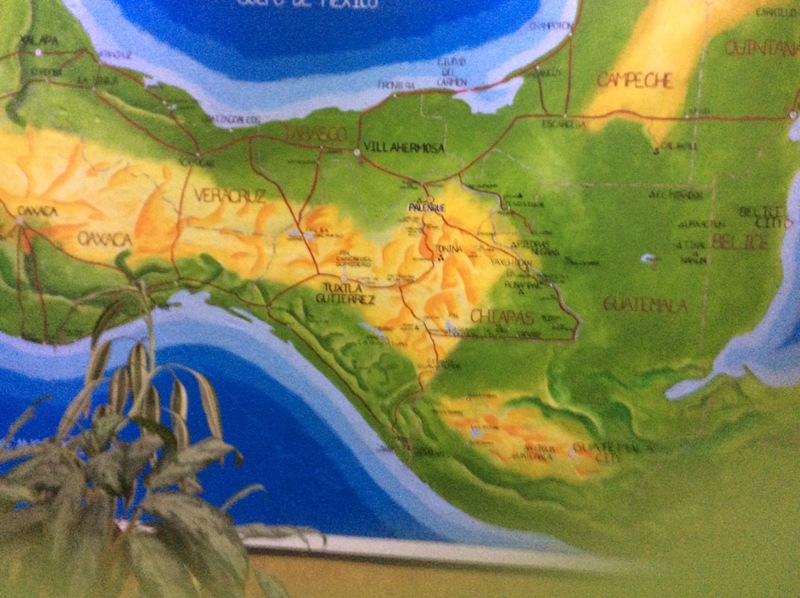 We eventually reached the capital of Tabasco, the large city of Villahermosa. The cities of Tabasco were mainly founded by the Olmec people, those of the large heads in the Museum of Anthropology in Mexico City (which seems all those years ago!). In mid afternoon we arrived at Palenque, the location of the large Mayan site. Our hotel was nice – clean and comfortable, although sadly we had no outside window, which made our room feel rather cell like. Nevertheless we brushed up reasonably nicely and I had a gin and tonic by the pool. Very satisfactory! Very little more to report for this day. Tomorrow the Mayan City of Palenque and the tomb of the great Pacal. Can’t wait! !